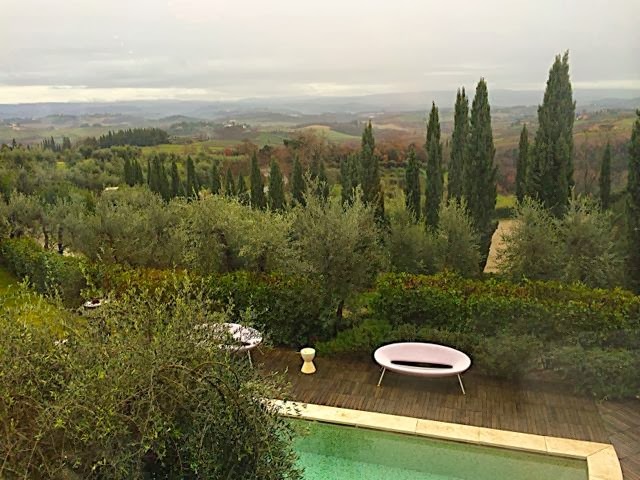 On this day dedicated for romance I will share with you a recent romantic getaway to Tuscany. We had been given a Smart Box gift for a night at a spa by the very generous colleagues in my husbands office. 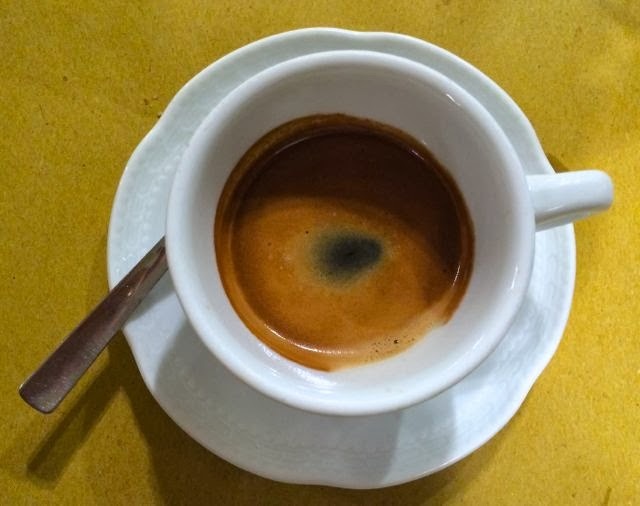 So, despite the dismal weather forecast, we headed north towards San Gimingano in Tuscany for some relaxation and the hope of some Tuscan sun. The morning spent doing the Wellness Journey at the villa San Paola was the perfect antidote to the lashing rain and thunderous clouds. 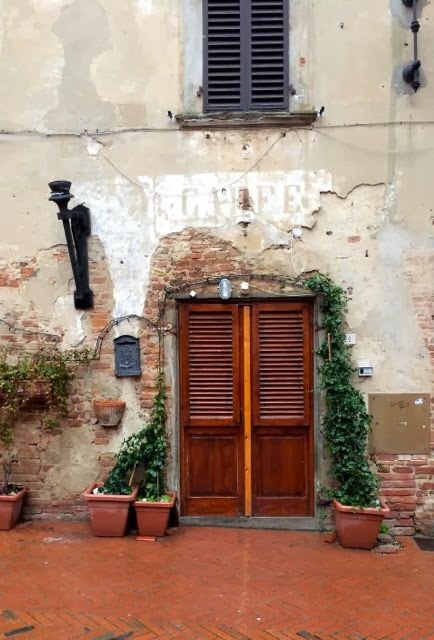 I could have stayed in the steamy Tuscan Aromarium with it's freshly cut sprigs of bay leaves, rosemary and juniper all day. 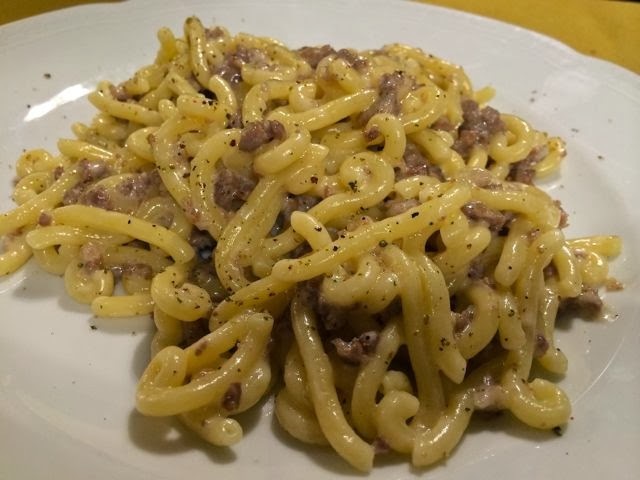 But, the sun came out and there was Tuscan cuisine to be explored. 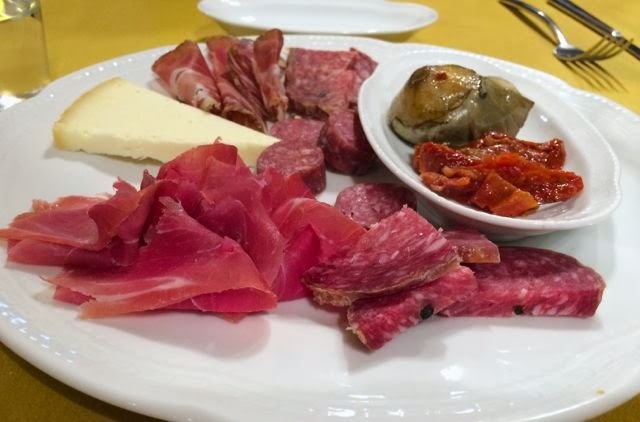 Again with the help of Judy Witts Francini's app Chianti Food & Wine we took off towards Certaldo in search of lunch. 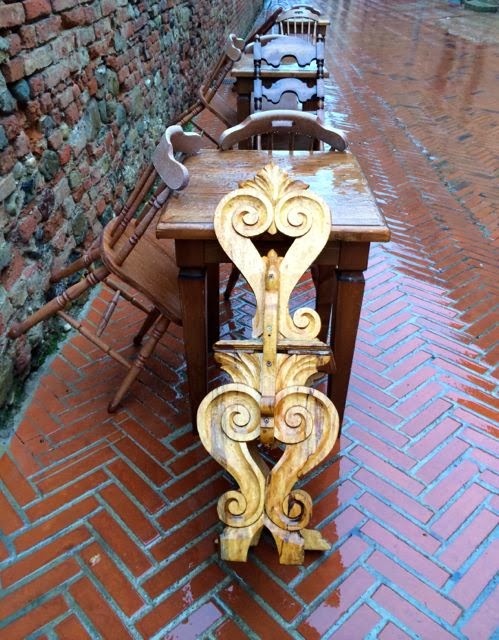 The town was off-season quiet, with many places undergoing renovations, but Osteria La Saletta had an Aperto sign in the window. 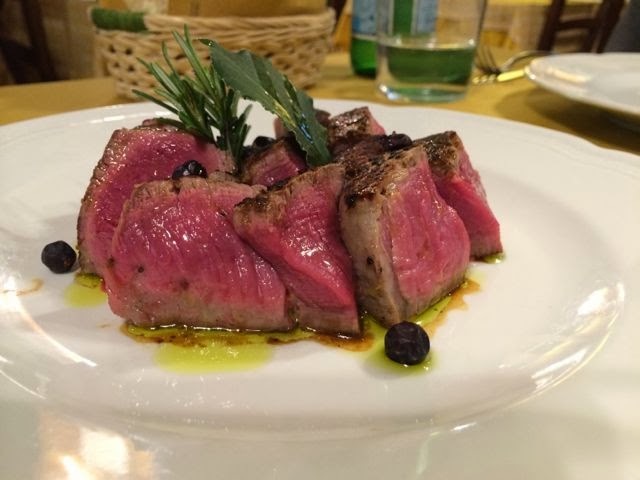 The friendly owner suggested a wonderful, robust Tuscan red to accompany our hearty pastas and steak order and we leisurely ate our way through a many coursed, late afternoon, Friday lunch. 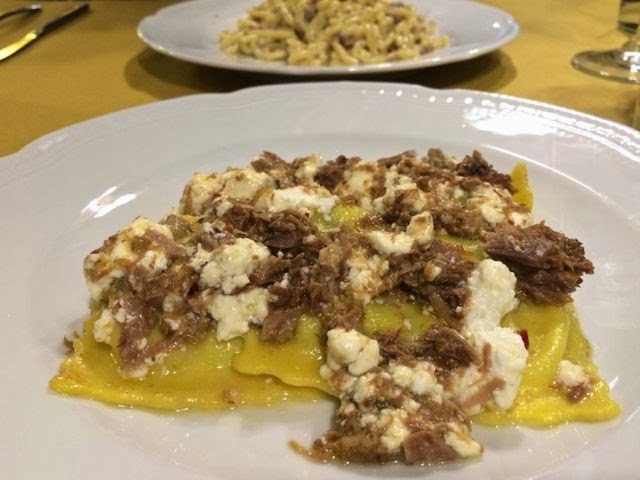 We swapped our (Richard Ginori) plates of ravioli with ricotta and slow cooked duck and pici with a chianti stewed rabbit sauce back and forth and reveled in the perfectly cooked and fork-cutting tender grilled Chianina beef filet. This welcoming spot could not be friendlier. Mama even came out of the kitchen to make sure we had enjoyed everything before she went home for the afternoon. 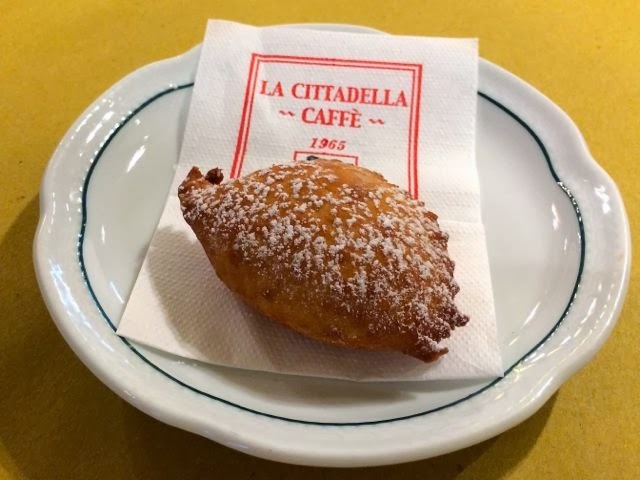 Our post-prandial coffee with accompanied by a Tuscan sweet, cream filled carnevale pastry. 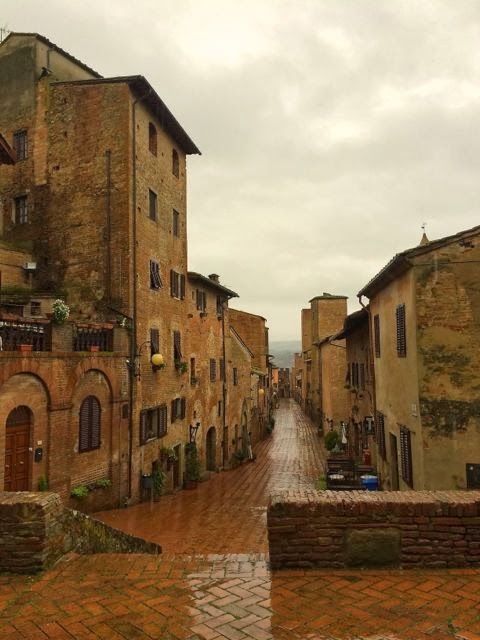 We needed to walk off that indulgent lunch so we hiked in the drizzle to Certaldo Alto and enjoyed having the entire enchanting place to ourselves. What beautiful photos - and how nice to have a brief getaway! BRAVA~!!! lovely write up of my little village!! !